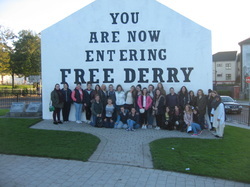 In my opinion the biggest highlight of the senior history programme is the two-day trip to Belfast and Derry that is available to all 5th and 6th year history students. Northern Ireland is huge aspect of our leaving cert course and this trip provided us with a greater understanding of Northern Ireland, as we were lucky enough to receive first hand information from people who lived through the Troubles and we able to visit all the different historical landmarks that we had learned about from our textbook. We departed early from Enniscorthy and made our way to the Belfast, where we began our tour by visiting the government building of Stormont. We were lucky to be received by a tour guide. Here we learned about how the government in the North is run and took part in a Q and A, which allowed us to obtain a greater insight into the politics of the Northern Irish state. We followed our agenda and travelled into the city where we grabbed a quick lunch by Belfast City Hall. From here our tour guide Nollaig joined us on our coach where she brought us on a tour through the city informing us on different facts on all the historic buildings and areas that were prominent during the Troubles. We drove through the peace line where we got to experience the difference between the two communities we’ve studied. The next stop was Milltown Cemetery we visited the grave of Bobby Sands and the famous Republican memorial. Along our route around Belfast we paid a visit to a couple of remembrance gardens, which were commemorating those whose lives were lost during the unrest in the North. We then hit the road and headed towards Derry. After a busy and tiring day we reached the lovely four star Everglades hotel where we enjoyed a gorgeous dinner, some of us watched a movie while others went back to their rooms early to catch up on much needed sleep. On day two we got up with the day had breakfast and piled back on the bus an headed towards the Apprentice Boys Hall in the city centre where an Apprentice Boy Stewart talked to us about their history right from the beginning and the Siege of Derry right up to the present day and their annual marches. The Apprentice Boys are an important case study in the Northern Ireland course and the information we received on this tour I believe was invaluable to aiding us to fully understand the loyal order. It also provided us with another outlook on the events of which occurred in Northern Ireland during the Troubles. After this we found ourselves at the Free Derry Museum where, we had a tour by a woman whose brother was a victim in Bloody Sunday and we lucky enough for her to give us her personal account of the history in which she lived through. Finally last but not least, and in my opinion the overall highlight of the trip. This was a tour of the Walls of the city and the Catholic Bogside and the sites of Civil Rights marches and bombings. Our tour guide was Adrian and ex IRA man who was prisoned for 11 years in the H Blocks as a result of his actions during the Troubles. He brought us through the Bogside where we saw the famous murals “You are now entering Free Derry”. Adrian shared with us his personal story and experiences of growing up in the Bogside during the Troubles. His accounts left many of us to say the least quite upset and touched. This was very beneficial and we were fortunate enough to be able to ask any questions we wanted to get a deeper and greater understanding with the catholic identity in the North. We all agree that this trip was a truly unforgettable experience and eye opening experience. We sadly had to say goodbye to Adrian to whom we could have spoken with for hours on end about his life story and the events that occurred in the North in the past. We piled back onto the bus with Friendly bus driver Gary and began and long journey back to Enniscorthy. By Mia Kelly, 6th Year History Student. A highlight of my 6th year so far and one of the most enjoyable aspects of the subject is the three day trip to Belfast and Derry that is offered to all senior history students. Northern Ireland makes up a huge percentage of the course and this amazing trip made the whole group gain a new understanding of ‘history coming to life’. Setting off bright and early from Enniscorthy we made our way to the North’s capital, Belfast, where we were joined by a tour guide who jumped on our bus and led us on a tour that not many visitors to the area would get to see. We made our way through the city with running commentary on all the historic buildings and areas that were bombed in both WW2 and the Troubles. Gradually we moved out of the city centre and into the infamous area of the Falls and Shankill roads. Driving through the peace line we saw clearly the difference between the two communities which showed the topics we’ve studied as a reality. Stopping off at Milltown Cemetery we saw the grave of Bobby Sands and the famous Republican memorial. Our next stop was Crumlin Road jail where we had an amazing tour of the entire building and saw the rooms set up as they would have been in the early 1900s. We then made our way to a four star hotel for dinner and a film to finish off a great first day. On day two, we were lucky enough to get a tour of Stormont, when in the middle of a talk we were visited by a Sinn Fein MLA who heard we were from Wexford and came to say hello. He was happy to stay for a Q & A which gave us an invaluable insight into the politics of the State. Our time in Belfast came to an end as we loaded up the bus and left for Derry. Upon arrival we were welcomed by a local councillor who brought us on a tour of the Walls of the city and gave his own experience of growing up during the Troubles. With a never ending stream of knowledge he showed us the sites of Civil Rights marches and bombings. He then brought us through the Bogside where we saw the famous murals and memorials and left us then at the Free Derry museum. Guided by a brother of a Bloody Sunday victim we got a detailed account of the events leading up to, during and after that day. Many of us left both angry and sad but it was an unforgettable experience. The tiring day ended back in the beautiful Everglades hotel with a table quiz that ended in a sing song. On what was unfortunately our last day we visited the Apprentice Boys Hall in the city centre where an Apprentice Boy himself told us the history of the society from the Siege of Derry to their annual marches. An important part of our course centres around the Apprentice Boys and this inside information will hopefully stand to us in June. Sadly this was our last stop and we piled back onto the bus with our beloved bus driver Dan and hit the road back South to Enniscorthy.